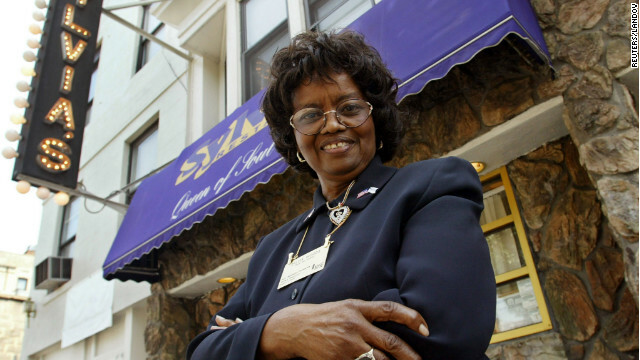 Sylvia Woods, owner of famed Harlem soul restaurant Sylvia's, died Thursday. (CNN) - Legendary restaurateur Sylvia Woods, known internationally as the Queen of Soul Food, passed away on Thursday, according to a statement issued by her family. She was 86. “Sylvia gallantly battled Alzheimer's for the past several years, but never once lost her loving smile,” her family said. She died peacefully surrounded by loved ones at her Westchester home. Woods’ world-renowned Harlem establishment, Sylvia’s, has drawn celebrities, politicians, tourists and locals alike to eat its famed soul food for more than 50 years.